I talked to my father for a while last night; as he knows, I’ve been more involved in Sri Lanka in the last few years, as my writing has increasingly centered there. In some ways, I’m more involved than he is these days — he left as a young man of about 30, and while we went every few years when I was little, we mostly stopped after Black July. I think my father hasn’t been back since 1995, when we all went for my uncle’s wedding? Even then, we stayed in the capital city, at the big hotels that catered to tourists, that seemed safer; most of us didn’t go to the north, where the conflict raged. I don’t want to speak for him too much, but I think it’s fair to say that his connection to Sri Lanka was in some ways a casualty of the war — he felt it was dangerous to travel there for a Tamil after the events of Black July, and he grieved for what had happened to his country. Even watching the news was painful. I went in 2005 with Karina, during the cease-fire, then again in 2018, with Karina, Kavya, and Jed. I would’ve gone more often, but first there was the war, and then small children, leading to lack of budget and lack of time. I have a little more time now. Kev and I have been talking about trying to go more regularly, with the whole family, so the children feel a real connection to their heritage. In America, it is so easy to lose track of that, swallowed up in the great melting pot, but I do think something is lost there. I tried to set up a semester in Sri Lanka at one point, with plans to take the kids out of school and enroll them in an international school in Colombo, but that ran aground on department logistics. But I took Kavi for the first time last December, and my plan was to try hard to start going more regularly, maybe once every 2-3 years. Attend the Galle Literary Fest perhaps — I was eight months pregnant with Kavi the year they invited me to be a guest, so couldn’t fly. Build more bridges with local writers, strengthening the Sri Lankan homeland – diaspora literary conversation. I have loved reading speculative fiction books from Mandy Jayatissa, Yudhanjaya Wijeratne, Navin Weeraratne in the last few months — there is a new flowering of speculative Sri Lankan literature, and it is so exciting. SF folks should read Navin’s _Zeelam_, for a vision of zombies in Colombo (with the remnants of war hovering in the background). You should read Yudhanjaya’s new Commonwealth Empire series, starting with _The Inhuman Race_ — a post-apocalyptic Sri Lanka, in a universe where the British never lost control of their empire. In the last few months, Yudha and I have been working on building that connection, creating a South Asian SFF Facebook group, encouraging people to read each others’ work. I’ve loved introducing them to Naru Sundarand R.K. Kalaw, and vice versa. Yudha will be here in just a few weeks, to read at Deep Dish in Chicago, and then he and I will be at the Nebulas in L.A., where he’ll be the first Sri Lankan nominated for that award. This — this is what I want. Free movement, enthusiastic exchange of ideas and cultural support. I don’t know what these attacks will do to tourism, which is a significant economic support of the island — there have already been some real financial problems there recently, with a government that has incurred massive debt (such as with the loan of Chinese money to build Hambantota Port, a loan they struggled to repay). 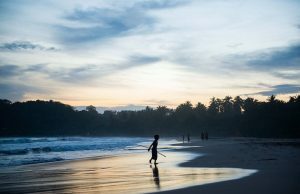 Chinese investors are pouring billions of dollars into Sri Lankan infrastructure and developments, but many local citizens feel the country is being sold to the Chinese. Tourism dollars would be better revenue sources, leading to a more stable economy and better opportunities for the locals. Friday morning, I actually met with the study abroad office, to see whether offering a UIC-led study abroad program might be feasible; that would let me teach a 3 or 6-week class there, and then stay longer if I wanted. The answer is possibly, though it’s a little unclear if students would be interested in taking a for-credit writing workshop in Sri Lanka. (Surprisingly, it wouldn’t cost that more than summer tuition here, so perhaps.) The next step would be talking to AISLS (the American Institute of Sri Lankan Studies) to see if they could be an institutional partner for UIC. Given events, I’m going to wait a little while to follow up with that. But not too long. I’ve been talking separately with Suchetha and Mandy about offering a writing retreat there in the summer of 2020 — it wouldn’t be cheap, given the cost of airfare + cost of food and housing, but it would be beautiful; I would love to teach a little writing and show people my country and feed you all the delicious food. We’d get up, do yoga, talk about writing over egg hoppers, do a writing exercise or two, have lunch out and an excursion, then a nap, more writing talk over dinner, a little beach time in the evening, with arrack sundowners and crab curry… I had talked to Sugi Ganeshananthan and Nayomi Munaweera as well, thinking that we could all go, perhaps offer a sequence of such retreats. Somewhere around $2200 + airfare for ten days, to cover room, breakfast and dinner, a driver and a van and plenty of water battles for excursions, visits to a turtle hatchery, a Madu River safari, entrance to the Temple of the Tooth, etc, plus a little teaching. Pay honorariums to local writers to come and speak / teach. We’ve even built in a little money to offer one scholarship to a writer of South Asian descent, to help them get back home. It would cost notably less if people were willing to share bedrooms. I wasn’t sure if anyone would be interested at that price, but I’d planned to write it all up and offer, with the hope of taking folks in 2020. Maybe a food tour too? Or combine them? Writing + food = best. (Maybe I can talk Roshani Anandappa into coming along and helping with the food tour bit.) I wasn’t sure which people would be most interested in, but I figured I could use Facebook to do research. Now I wonder — will people be scared to go? I saw photos of the Sri Lanka airport last night, with the departure lounge jam-packed with tourists. The streets under curfew are shockingly empty, where normally they’d be filled with cars and tuk-tuks and bicyclists. Yet at the same time, my dad said that as soon as the schools were reopened, he expected people would be back to school, back to work. They lived through the war, after all, and for most people, life didn’t just stop. I know he’ll worry if I go back, if I take the children. Well, it won’t be soon in any case. We can hope that this was a single isolated attack, that they’ll identify the perpetrators quickly, and cut off any chance of them acting this way again. In the meantime, I’ll keep researching these trips, making plans to return as soon as I can. 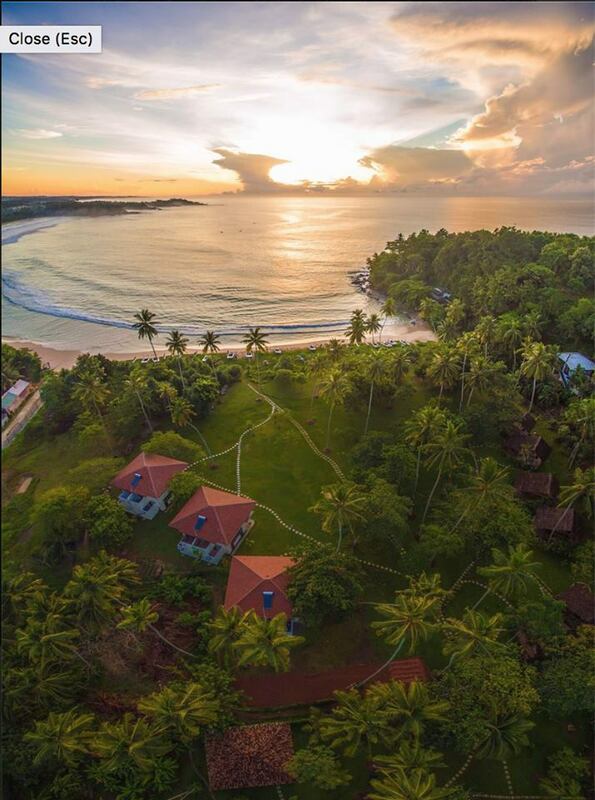 This is Talalla Retreat, beachside in Talalla, one of the places we’re considering for the writing retreat. I haven’t been, but my friends there tell me it is private, serene. 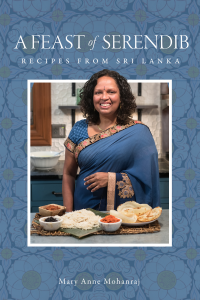 All day, I’ve gone back and forth between wanting to keep posting photos from the Sri Lankan cookbook and feeling that it was inappropriate, that I shouldn’t be thinking about this right now, in the wake of such tragedy. But there is both a practical and a heartfelt reason to keep posting them. 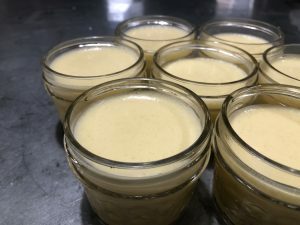 Heartfelt — it’s a project that was never about making money; I can make more money in a few weeks of fiction writing than I likely will from several years of working on this cookbook. I started writing this book because I wanted to reclaim heritage cooking, for myself and my children, but also to share this food, this country, that I love with you all. 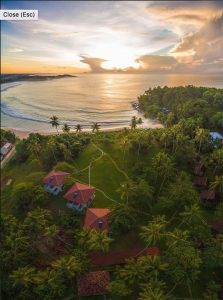 Which I suppose circles back around to practical — Sri Lanka is going to take a huge tourism hit from this attack; if I can convince a few more people that they want to see and visit and taste the food of this country, that is probably the most concretely useful thing I can do to help. When vegetarian Karina was our girlfriend, twenty-something years ago, I barely knew how to cook. But I made these potatoes for her, and she loved them, and when she came back to visit, even years later, long after we’d broken up, Karina asked me to make them again. I made deviled potatoes for everyone I knew, back then. 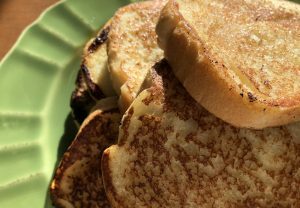 And though I cook many other dishes now, this one is a touchstone, a simple, sure-fire reliable comfort. So let me give it to you. A gift from Sri Lanka (with my mother’s American adaptations), that you may know my little island country better, and maybe cherish it a little. Use plenty of cayenne if you want to try it authentic style. If it makes you cry a little, maybe that’s okay. 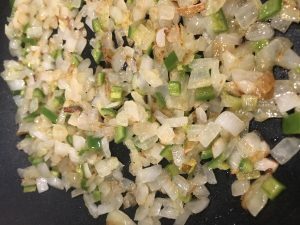 This was the first vegetable dish I learned to make, and I still find it addictive. 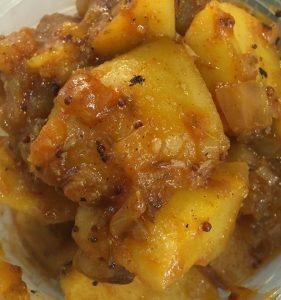 It’s great with rice and a meat curry, but also works quite well mashed up as a party spread with triangles of toasted naan. 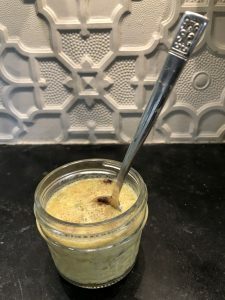 For a little more protein, you could add canned and drained chickpeas when you add the potatoes. 1. Sauté onions in oil on high with mustard seed and cumin seeds until onions are golden/translucent (not brown). Add cayenne and cook 1 minute. 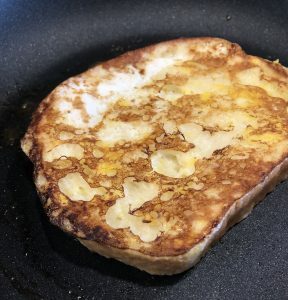 Immediately add potatoes, ketchup, and salt. 2. Lower heat to medium and add enough water so the potatoes don’t burn (enough to cover usually works well). Cover and cook, stirring periodically, until potatoes are cooked through, about 20 minutes. 3. 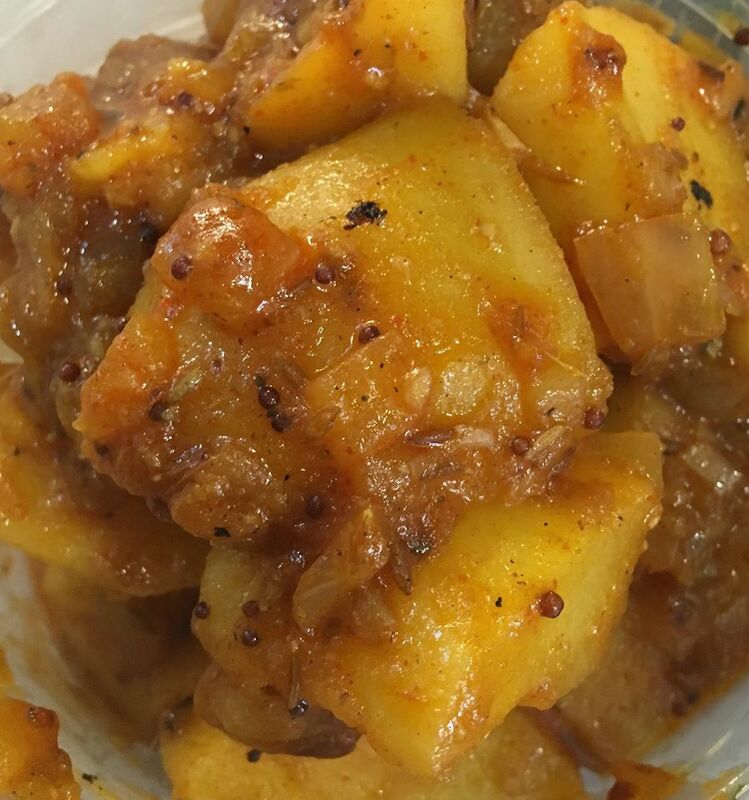 Remove lid and simmer off any excess water; the resulting curry sauce should be fairly thick, so that the potatoes are coated with sauce, rather than swimming in liquid. 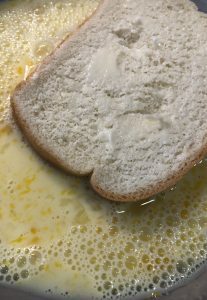 Add milk, if desired, to thicken sauce and mellow spice level; stir until well blended. Serve hot. I did some photo editing for the Sri Lankan cookbook this morning, but then switched to one last board game with Jed, who is heading home in a few minutes. He offered to change his flight and stay, but while I’m shaken, it’s not as if there’s anything he, or I, can really do about it from here. I told him to go home. Fly safe. We’d planned to play Spirit Island, a game that we’ve been meaning to play for some months — we’d even set the game up last night, but hadn’t gotten around to playing. 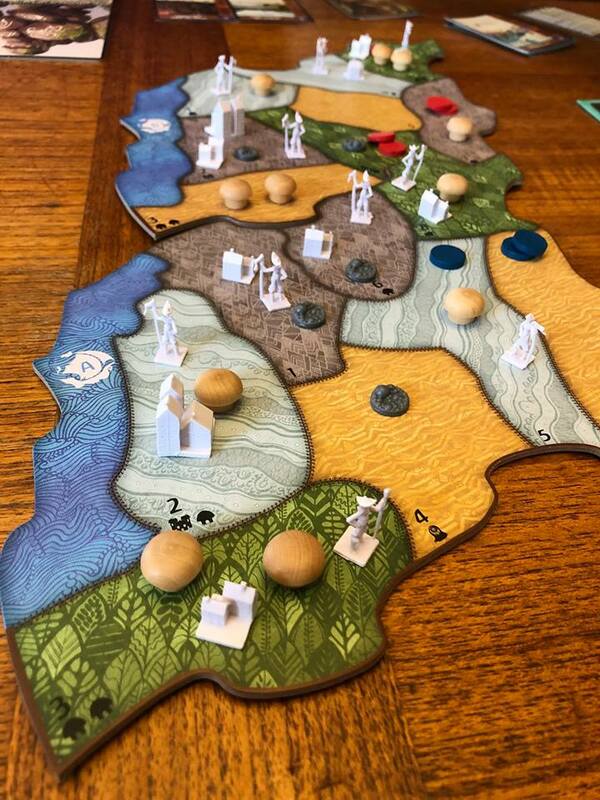 It’s a cooperative game where you play the spirits of the island, working with the locals to defend against foreign invaders. I welcomed the distraction of a board game, but at the same time, would periodically look at the island board and find myself tearing up. Sympathetic magic — ridiculous, and yet, there I was, wishing the spirits of the island might rise up, and speak for peace. 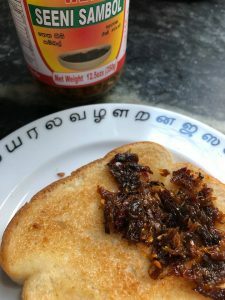 In between rounds, I made myself cups of strong Ceylon tea and slices of toast, slathered with butter and seeni sambol. I ate them off the plate rimmed in Tamil letters, a plate that Kavi and I picked out at Paradise Road last December, when I took my daughter to Sri Lanka for the first time, so happy to show her this beautiful place that is half of her heritage, this island I love beyond all reason. While we played, I kept using pauses (Jed’s a thinker when it comes to board games, where I am more impulsive) to check the news. The NY Times piece was slower to come out than some reports out of Asia, but is nicely comprehensive, and gives some good background for those not familiar. My little island has had ten years of blessed peace, after three decades of weary conflict. I wrote ‘conflict’ and then ‘war’ and then ‘conflict’ again. I don’t know what the right term is, even now, after studying it for so long. How do we name this sort of terrorist action, when the opposing group is unknown or ill-defined? I am teaching a post-colonial lit. class right now, and have just finished grading papers where many of my students wanted to argue that violence was justified against the invaders, the oppressors. Many of our texts, such at the Irish revolutionary poems and songs, led them in that direction. But I asked them, in just this past Monday’s discussion, if they were sure violence was justified. How much violence? Against whom? What about suicide bombers, walking into peaceful places, killing children? Where is the line between freedom fighters and terrorists; is the line drawn in motivation? In actions? Ifyou are just a few individuals, trying to resist the power of an oppressive and powerful state, you might be drawn to unconventional forms of resistance, of warfare. Yet surely there is a line where you have gone too far. And what if your motivations are grounded in hatred, rather than in oppression? What drives people to such extreme acts? My students had no answers for me. Today, all I do is check the news compulsively, listen for what little word is coming directly from friends and family on the ground, try to piece patterns out of sheer incoherent horror. Desperate to understand. Surely it wasn’t accidental that the terrorists chose Easter Sunday for this attack? One sourcelander friend suggested that the reason the big hotels were targeted was because they were holding Easter brunches, so it was actually the same population attacked in both hotel and church locations. Perhaps? Catholics are 6% of the population of Sri Lanka; although I’m not religious myself, I was raised Catholic and most of my extended family there is Catholic too. They must be in such fear right now, waiting to hear whether the government has caught the perpetrators, waiting to hear whether it is safe to venture out again. What possible threat could the perpetrators feel from a tiny percentage of Catholics? It makes no sense, no matter how I approach it. 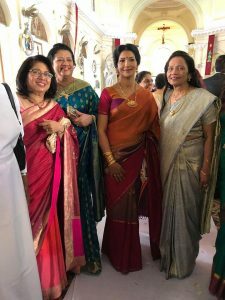 The photo below is one I took last December, of my mother, her sisters, and their first cousin, mother-of-the-bride at a wedding in a Catholic church in Colombo. I can still remember how it felt, baking in the heat of the church with Kavi leaning on my shoulder, watching my beautiful cousin come down the aisle. I don’t live in Sri Lanka; I was born there, and left when I was only two years old. I was just talking to Kevin yesterday about how I don’t quite know how it was that so much of my writing work has ended up centered there. I didn’t have to write about that country; I didn’t have to feel connected, to care. And yet here I am, caring. But for all my study, and despite my relatives and friends who still live there, I’m not a stakeholder in the same way as someone embedded in the community. I have no answers, and even hesitate to ask the questions. Yet, how can we not ask? Why did this happen? Why now? Dangerous questions. We need answers, but as soon as you start framing the questions, it’s so easy to slide into us vs. them, reinforcing and reifying divisions — divisions that then lead to politicians and their rhetoric, and the cruel policies that so often follow. We are living that reality here in America, brutalizing those who flee violence to seek refuge on our border, tearing children apart from their parents. I am not religious, but if I could pray, I would. I send messages out to the universe, composed of tea and tears. After so many years of peace — please, let us not descend into madness again. Please. My plan for today was to finish editing cookbook photos and post them here, along with garden photos, family photos, maybe even Sri Lanka trip photos, if I had time. It feels frivolous now. But it’s 7 p.m. in Sri Lanka; the island is under curfew, and we may not get much in way of news for quite a while. Sometimes, all I know how to do is work, and hope that the work helps, somehow. What is the role of the diaspora in moments like this? What is the role of the diaspora in moments like this? I’m trying to amplify sourcelander voices as I can — though with the social media ban, very little is coming through, except from a few of my more techie friends using VPNs. I’m trying to only disseminate accurate information — triple-checking sources, avoiding repeating anything that seems like it might be partisan. I don’t know what to think of the curfew and the social media ban, honestly. While the curtailing of freedom of movement and freedom of speech is always deeply concerning, the government is in the midst of an active situation, with perpetrators still to be identified. Rumor and misinformation can so easily feed humanity’s worst impulses — I’ve already started seeing vehement anti-Muslim rhetoric on some sites, and anti-Buddhist, and anti-foreigner. Mostly, we hold Sri Lanka in our hearts, hoping for a swift resolution to this, hoping for peace. Author Mary Anne MohanrajPosted on April 21, 2019 April 22, 2019 Categories UncategorizedLeave a comment on What is the role of the diaspora in moments like this? People have been asking; while we have some extended family in Sri Lanka, much of the family left as refugees after Black July in 1983, and settled in Canada, U.K., and America. Particular gratitude to Canada for its generous immigration policies of the time. The wedding that Kavi and I attended at a Sri Lankan church last December was for my second cousin; her mother still lives there, and I just checked in — she spoke to her mother recently; Niru Aunty is fine at the moment. I think it’s unlikely that I have any family directly affected by the attacks, and I’ve managed to check in with most of my local friends, and they’re okay too. Thank you for your concern; I’ll update as I learn more.